Yesterday we joined the Vancouver Heritage Foundation’s Laneway House Tour to get the inside look at seven new laneway homes around Vancouver. Luckily, our designer, Laurel, was able to join us and even drove us around in her nice car (thanks, Laurel!). There were homes by Smallworks, Lanefab, LaneCraft, and Urban Lane Homes. It would not be fair to compare homes to homes, because some were built on large lots and could use more square footage, some were obviously built to rent, and most didn’t have furniture so it was very hard for me to tell how places would look when they had people’s “things” in them. It was good to see what different builders and designers did with their homes, given the very strict rules about building LWHs. Of course we had favourites, due to the features that we could appreciate. Several homes had low kitchen windows between the upper cabinets and the counter. You get to keep your window and your storage, too. blinds that pull up from the bottom of the window, rather than from the top. I can see us using them in the upstairs windows, letting in light from above while blocking the view into the room from outside. Smart Garage Doors — I had wondered about how we were going to install a garage door without using one of those systems that take up half the garage ceiling — but these roll into a nice tight tube right inside the door. Not one of the garages was used to park cars in, by the way. Everyone is using them for extra living space, and had TV feeds and telephone jacks already installed. polished concrete floors — I know they are nice looking and they are hip and stuff, but I just don’t like them. I think they look cold and they remind me of unfinished basements and parking garage floors. apron sinks — ugh, just don’t get it. Also those glass-topped stove tops. hot tub in the living room. Don’t ask. Most of the kitchens were very small — like a total of maybe 25 square feet of area (not a surprise). Almost everyone had nice counters, but a couple of places used cheaper cupboards. You’re going to open and shut that drawer 10 times a day for years — why not get the better product? And the one thing that surprised me the most? DH and I cannot agree on what colour is yellow. We want to paint the house yellow to match the main house. This weekend the designer, Laurel, came over to show us the concepts the team had come up with for the renos and the laneway house. This is the preliminary preliminary part of the design process. First they showed us all the plot lines, etc. of the current home. The property slopes quite a bit from the front to the back, and that gives them some chances to put the laneway house onto more than two levels. Then they showed us three ideas for the basement reno. The idea is to split the space into a legal suite and a family room/bedroom/bathroom/laundry room combo for the homeowners (DD and DSIL). The first plan was a split with one third suite and two thirds family room etc — not quite right. Then they showed a design for a half and half arrangement — too much suite and not enough family etc. Then, just like that Goldilocks story, they showed one that was just right! The suite will be a studio, but the family room, etc, is lovely and spacious, with room for a nice bedroom. Then they showed us a very clever way to split the back yard between two spaces, that could be combined just by opening a gate. Very handy when one of the homes will have a dog and the other home will not. Or will have a different dog. Then onto the laneway design. The first design they showed us was the main floor — bedroom with closets, bath, laundry, etc. Nice, but…..Then they showed us the design tweaked by moving the closets out of the bedroom and into a separate space with the washer. Yes! Love it. Love the staircase. Love the idea of French doors onto the yard half way up the staircase (using the slope in the yard to provide access at that level). The top floor looked great, too. Small galley kitchen with counter for eating. Very small sitting room with good-sized deck. Loved it. Loved the roof lines, too. Many levels of flat roof (living roofy-garden) with a gable open to the top floor over the stair case. So light and airy! They also had plans drawn up for a top floor with a gable roof — there would be more storage on top, but the design was ix-nayed by Cal, who just didn’t like it as well. I didn’t like it as well, but it was also cheaper. When someone says cheaper, even if I know I don’t like it nearly as well, something deep in my wallet says to give it a chance. So it’s good that I don’t have to consider that plan. Too much choice makes a person insane. Next Saturday we will go for the Lane Home Tour put on by the Vancouver Heritage Foundation. DD had to bow out because she is attending a wedding, so we were able to offer her ticket to Laurel. Looking forward to seeing what other people are doing with their homes. Well, we’re not ready by a long shot. We keep throwing stuff out and giving it away and it just seems to quadruple in volume overnight. A couple of weekends were all it took to get both bathrooms painted in an almond colour. It brightened up the main bathroom, but made an astounding difference in the second bath which had been rag painted in a bright orange. Next we will look for some nice second-hand lighting fixtures. One of the problems we have found when trying to replace a builder-standard light-bar fixture is that all the second-hand bathroom lights look exactly like what we are trying to get rid of. We will go out to Habitat for Humanity’s ReStore this weekend to see what they have. To go into the main bath, I made up a little picture. 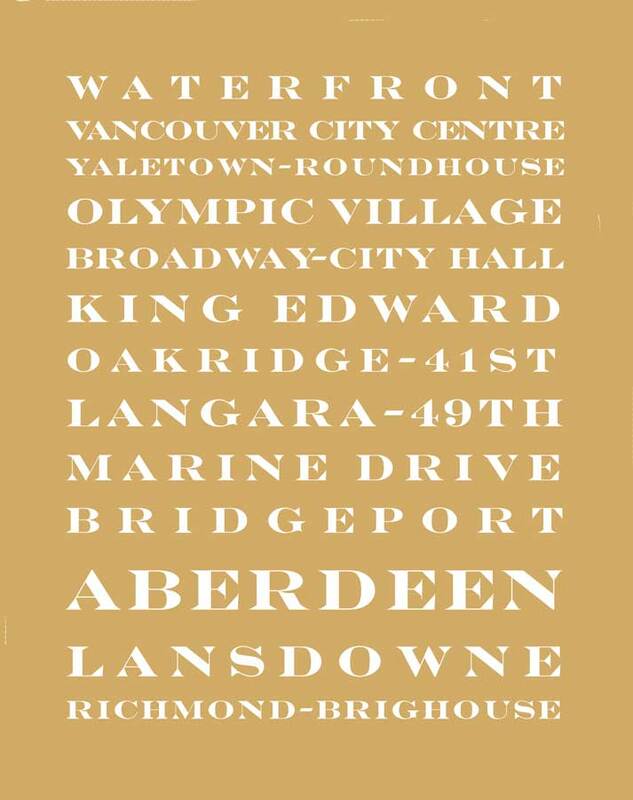 I‘ve been quite taken with those subway signs like those Restoration Hardware sells, and thought it would be nice to remind people who view our little home how close we are to the Canada Line. It took me about an hour to make it up and I found a nice little frame at Michael’s to put it in and show it off. In other news, DD looked out her kitchen window last week to find some men standing around surveying. She asked them what they were looking for, and they said they were just seeing where the sewer line was. For the laneway house. So if the City of Vancouver knows it’s true, it must be true. Meeting with the gang from the builders/designers this Friday. Should be interesting. The designer emailed us today asking how tall we were. Posted in Laneway House and tagged Lane Home, Laneway House. Bookmark the permalink.